Both HBO Go and WatchESPN require Apple TV users to have paid for the channels through a cable or satellite subscription. Apple TV's catalog got a double boost Wednesday with the addition of two popular and long-awaited apps: HBO Go and WatchESPN. HBO Go includes on-demand access to all of the premium channel's shows, movies, comedy specials and other content. The WatchESPN app features live sports events as well as on-demand video content. Both apps require that users subscribe to the channels through a cable or satellite provider. 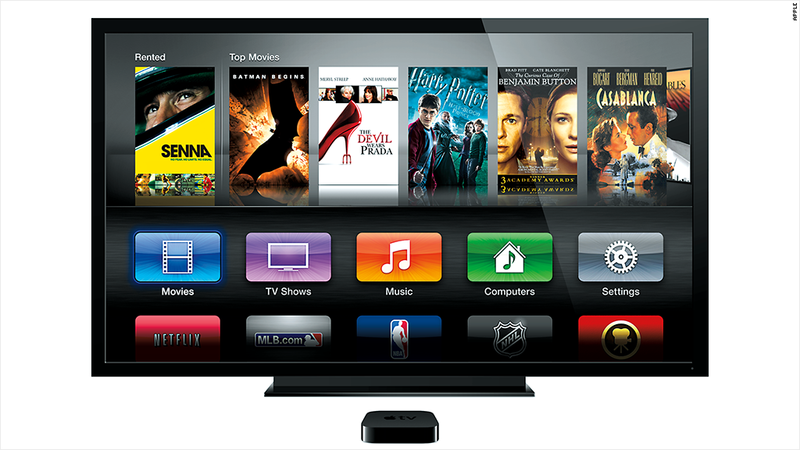 The addition of HBO Go and WatchESPN add extremely high-end content to the Apple TV box. (HBO is owned by CNNMoney parent company Time Warner (TWX).) Both apps had been previously been available for the iPhone and iPad -- and are two of the most popular apps on the platform, Apple (AAPL) said Wednesday. They were also both available on Microsoft's (MSFT) Xbox 360, and HBO Go could be found on the Roku set-top box. Disney's (DIS) WatchESPN represents one of cable providers' best defenses against cord-cutting: live sports. Pay-TV's biggest advantage is that they typically air programming before streaming services do, and live events have been a no-go on sites like Netfli (NFLX)x. But sports and other live events are slowly trickling out of the cable realm. Streaming services from MLB, NBA and NHL have previously been available on the Apple TV and other streaming devices, and the NFL recently signed an exclusive deal with Verizon (VZ) to stream football games to mobile phones. In addition to HBO Go and WatchESPN, Apple also added two international content providers, Sky News and Crunchyroll, and the concert-focused Qello.